Just got a D800, moving up from D300 and D700. Naturally I want to get the most out of this camera. I'm an employed photographer and use this equipment at work, but with the daily workload I simply never have time to do any testing, so I thought I should hear what people's experiences are. I should say that I work at an art museum, so naturally a large part is art reproduction for print, or documentation for conservation purposes, both "flat" and three-dimensional. But I also do a lot of events and publicity. Nikkor 50mm f/1.8. Cheap and unassuming, but this is in fact my main workhorse. I use it all the time. Is the 1.4 any better? Nikkor 85mm f/1.8. I previously used this a lot for stitching, but hopefully there won't be too much need for that with the D800...other than that a good lens for all the usual reasons. Nikkor 35mm f/2. This is a lens I feel I "should" have, but oddly I don't use it much. Sigma 24mm f/1.8. I got this as a replacement for a broken Nikkor 24mm f/2.8, expecting it to be merely "usable" - but I was in for a surprise. This is in fact an excellent lens, very sharp, with only a little CA towards the corners. I use this all the time, it's my main "event" lens. But is a Nikkor significantly better? Money's always tight, so price matters. For close-up I got a Micro-Nikkor 60mm f/2.8, but that was a disappointment. I'm sure it's an excellent lens, but it feels too short. I get this weird feeling that the focal length decreases the closer you focus. So I found an old 105mm Micro-Nikkor, the manual focus variety, which is OK because it's only used in a controlled studio setting using strobes. This lens feels a lot better than the 60. For this I also have a PK-13 extension tube. But would the Micro 60 do better than the regular 50 in terms of flat field, at both close and normal distances"? When I take the camera home for my personal stuff (yes, I'm allowed that), I use the 24 and 85 mostly. But it's at work that I really need to push the technical quality as far as possible. Can I settle for these lenses, or am I not getting the full potential out of this camera? So I found an old 105mm Micro-Nikkor, the manual focus variety, which is OK because it's only used in a controlled studio setting using strobes. This lens feels a lot better than the 60. For this I also have a PK-13 extension tube. I have a 55mm f3.5 Micro Nikkor from the 70s and it's the sharpest lens I've ever used. My D800 loves it. I agree about the focal length, though. It's a bit short for real macro work. For that reason, I ordered a "bigger sister" manual focus 105mm f4 from KEH. I sent it back. It might have been just the copy I got, but it had nowhere near the resolving power of the 55. Can't comment on the other lenses, although a friend has current-version AF VR 105 Micro Nikkor and it looks pretty close to my 55. I just bought Nikon 60mm AF-S G (flat field), hoping that it would outperform my old Nikon AF 50mmF1.4D on D800e. I cannot see any significant improvement in sharpness. I also compared it to a pretty sharp Sigma 70mmF2.8 that also is flat field lens. Sigma is a bit sharper, although it has a bit more pronounced CA. Tested at F5.6-F9, at 15 feet distance. My 22MP Mamiya ZD with Mamiya 80mm AF2.8 and especially Mamiya 55mm AF2.8 is quite noticeably sharper - bitingly sharp. Unfortunately, none of the above lenses give that bitingly sharp MF quality result. As a result, I have an impression that ZD has about the same, or possibly even more details in a smaller file (after it is compressed to DNG). Does anyone know of any 35mm AF lens (besides $$$ Coastal Optics) that would give truly sharp (MF quality) D800e files? The new Sigma 35mm F1.4 lens is getting rave reviews world wide even some are saying like Lloyd Charmers that in his opinion it is the worlds best 35mm to date. I have one order for my Nikon D800E even though I have the Nikon 35mm F1.4G lens as it is the good. I also compared it to a pretty sharp Sigma 70mmF2.8, also is flat field. Tested at F5.6-F9, at 11 feet distance. I purchased the 60mm AF-S G last week for the D800. For many years, I used a Hasselblad multi-shot back attached to a pancake camera mounted with a 72mm Digitar (with electronic shutter). For copystand work, the Hassey system was out of this world--especially for fine art reproduction where absolute color fidelity and micro contrast are essential. The H120 makro planar lens is also stunning. However, the Nikkor is a very serviceable lens. The linear distortion is well-controlled and the generic ACR 7 lens profile does a decent job of correcting falloff and tweaking linearity. I think the best solution for a flat field lens on a 35mm camera would be a top-of-the-line enlarger lens. I haven't researched it, but there's got to be a way to mount one onto the D800. As far as mounting the camera to another device capable of accepting Digitars, The Cambo X2-Pro is too awkward for my taste and the Cambo Ultima 35 is clunky. I would love to see how a 1980s Nikkor 55mm macro lens compares to the 60mm AF-S G.
Now that I have retreated from fine art repro and use the copystand for other applications, the D800/60mm combo is great. Hi Simon, I hope that Sigma will raise the bar with all upcoming newer lens models. I am tempted by this lens also, but for my application will have to wait for the both wider and longer lenses of the same quality. It would be interesting to see how it performs on D800e vs top MF glass. I use the Horseman VCC system using Rodenstock Rodagon and Apo Rodagon enlarging lenses for all my art reproduction, jewellery, food and drink photography with excellent results. These Rodenstock lenses on my Nikon D800E are superb. Lens rentals has posted a page describing the best lenses for D800. and the ZD is at 9 microns, I would guess. MTF drops with frequency. I got a test shot from Tim Parkin using a 25/2 Zeiss Distagon on the Nikon D800E, it has about 37% MTF at Nyquist. The Mamiya with it's larger pixels would have Nyquist at around 2667 on a the same figure and there the lens would transfer around 70%, almost twice the contrast. So pixel for pixel the Mamiya should have better contrast, but I guess that you can compensate with more sharpening. I guess that the Mamiya lenses are quite good. 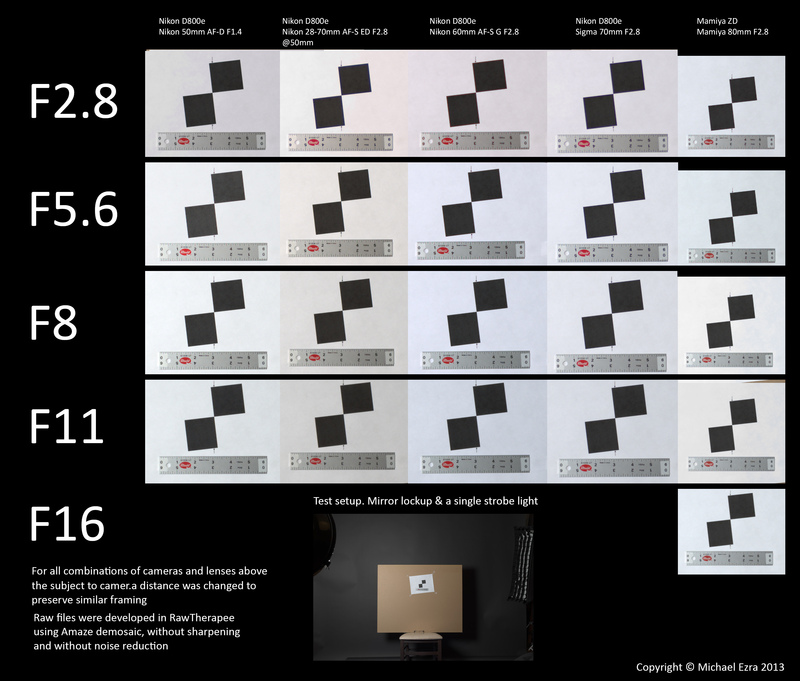 Having high MTF at large pixels sounds like a recipe for creating aliasing artifacts. I would expect you to have a lot of that on the ZD. Could you publish a pair of comparable images, preferably raw? If you have an image with slanted edge, it would be helpful. Hi Erik, you are right, ZD is very prone to moire, while it is pretty rare and faint on D800e. I will try to shoot publishable test images over the weekend to post here. Nikon 85 f:1.8 G, 35 points, the SHARPEST lens they have measured so far (lens + camera combination, D3x). $500. Sigma 50 f:1.4 DG, 28 points, sharpest normal lens so far. $500. Sigma 35 f:1.4 DG, 30 points, the sharpest mid-wide so far (measured with canon 5D3, D800 should be better). $900. Nikon 24 f:1.4 G ED, 29 points, best "landscape-wide" so far. Almost $2000. Carl Zeiss Distagon T* 15 f:2.8, 23 points, best ultra-wide. $3000. As we can see, the quality goes down with wider angles but prices explode, so stitching, when possible, is recommended. Nikon 85 and those Sigmas are real winners in both quality and price. I think the DxO data is basically good but I am very skeptical the figures of merit they have. If you include a slanted edge target I can measure the images with Imatest. The MTF plots probably tell a story. It should be tilted according to the marks at bottom and top. Would it be sufficient if I use a single piece of white paper (so no checkerboard pattern), angled as in your illustration. Considering the difference in resolution of ZD vs D800e and the focal differences of their lenses, would it make sense to capture images where target is the same size, measured in pixels? Which apertures would you prefer for each camera? 1. Sigma is generally held in high regard, which confirms my favorable impression of the 24/1.8. The ultimate 24mm would be the Nikkor 24/1.4, but that's simply too expensive at the moment. Carl Zeiss could also be worth looking into. 2. The Micro Nikkor 60/2.8 is a superb lens on its own merit, although a little on the short side for macro work. But it could replace the 50/1.8. 3. Nikkor 85/1.8 is, as I suspected, an almost perfect lens to go with a D800. Using an enlarger lens for flat field is an interesting idea, but I'm not sure where I would find a good one. I think we have a Leitz Focomat stuffed away somewhere, but how those old lenses perform in color I don't know (CA ?). For now I shot ZD at such subject-to-cam-distance that framing closely resembles D800e. While changing lenses on D800e I changed the subject-to-cam-distance to maintain the framing as well. I am converting all files to high quality sRGB jpgs, cropped to the target. Its interesting how reviews can give different out comes. Photozone rates the Sigma 50mm F1.4 EX DG HSM with only 2 stars out of 5. While changing lenses D800e I changed the subject-to-cam-distance to maintain the framing as well. Looking at these samples I see that D800e file certainly can capture more detail than a file from ZD, at the same framing. My previous comparison was based on shots of live (and different) models, which made it seem otherwise. Attached is the slanted edge target used for this test. "Low contrast" is the plain output from RawTherapee, "High contrast" version is after an additional Luminosity curve was applied to all crops (in 16 bit precision) within Photoshop. P.S. in your post above two images are the same.